Current underground rock chip samples were collected in panels 15-20 centimetres wide over intervals determined by styles of mineralization (vein or silicified wall-rock breccia). Samples were collected from the vein material in the back of the underground drift with footwall and hangingwall samples collected on either side of the vein wherever possible. 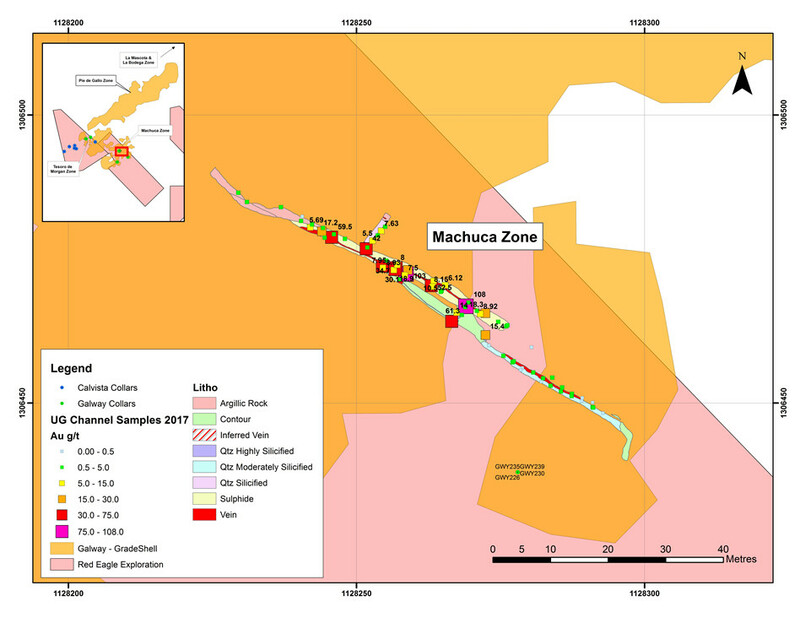 Sampling encountered a higher grade mineralized zone with a total strike length of approximately 45 metres which is open in all directions. The total width of the mineralized zone is not known since the width is limited to the width of the drift (approximately two metres). The average width of the vein is 0.3 metres with length-weighted average grades of 32.19 g/t Au and 185.1 g/t Ag. Please see Figure 1 (below) and Table 1 for complete results. Elevated gold grades are present within the wall-rocks to the vein. In one location, a sub-level exposes a six metre horizontal width of mineralization within the footwall of the vein with a length-weighted average grade of 3.85 g/t Au and 78.4 g/t Ag. 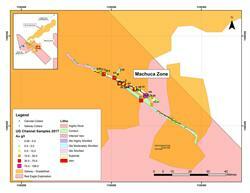 The length-weighted average grades of the wall rock within the higher grade zone are 5.8 g/t Au and 227.5 g/t Ag. Assuming a two metre width, the average composite grades are 9.8 g/t Au and 221.1 g/t Ag. Sample preparation and analytical work was performed by ActLabs of Medellin, Colombia a certified commercial laboratory. During sampling, quality control standards, field duplicates and blanks were inserted in to the sample batches to monitor laboratory performance; all consistent with industry best practice. Rock chip samples have undergone sample preparation consisting of crushing to 80% passing 10 mesh, and pulverization to 85% passing 200 mesh. Gold analyses are conducted via Fire Assay Fusion with AA finish, and gravimetric analyses are completed for over-limit (> 5g/t) samples. Silver assays are conducted via Agua Regia digest with an AA finish. The intercept depths and true thicknesses of the historical drill holes are unknown at this time and not all mineralized intercepts may be within XR's properties due to the length and orientation of the drill holes. The California Gold Project comprises 250 hectares within the prolific California-Vetas Gold District, Santander, Colombia, which also contains the multi-million ounce La Mascota, La Bodega and Angostura gold deposits. The gold-silver-copper mineralization in the California Gold Project is part of the same large mineralizing system localized along a regional northeast-trending fault zone. Mineralization occurs in northeast, northwest and east-west striking, generally steeply north-dipping fault structures containing high grade veins up to two metres in width. Vein mineralogy includes pyrite, chalcopyrite and sphalerite. Elevation ranges from 2,400 to 2,700 metres above sea level, far below the Paramo boundaries. XR is advancing the California Gold Project toward economic feasibility by the delineation of high-grade vein resources exploitable by modern underground mining methods. Underground mapping of existing mine workings and underground channel sampling are currently underway, prioritizing targets for underground diamond drilling as soon as possible. The technical information contained in this news release has been reviewed and approved by XR's Vice President of Exploration, David G. Thomas, P. Geo., who is a "Qualified Person" as defined under NI 43-101. XR is a precious metals exploration and development corporation majority owned by gold producer Red Eagle Mining Corporation. XR has an experienced exploration and mine development team focused on building shareholder value through acquiring and de-risking high grade gold and silver projects with low costs and low technical risks in Colombia, a jurisdiction with prolific historic production but until recently limited modern exploration. XR owns 100% of the Vetas Gold, California Gold and Santa Ana Silver Projects, which consist of numerous historic and existing mines and where exploration is currently underway to delineate high-grade vein resources exploitable by modern underground mining. Neither the TSX Venture Exchange nor its Regulation Services Provider (as that term is defined in the policies of the TSX Venture Exchange) accepts responsibility for the adequacy or accuracy of this release. Information set forth in this news release includes forward-looking statements under applicable securities laws. Forward-looking statements are statements that relate to future, not past, events. In this context, forward-looking statements often address expected future business and financial performance, and often contain words such as "anticipate", "believe", "plan", "estimate", "expect", and "intend", statements that an action or event "may", "might", "could", "should", or "will" be taken or occur, or other similar expressions. All statements, other than statements of historical fact, included herein including, without limitation; statements about the terms and completion of the proposed sale transaction are forward-looking statements. By their nature, forward-looking statements involve known and unknown risks, uncertainties and other factors which may cause the actual results, performance or achievements, or other future events, to be materially different from any future results, performance or achievements expressed or implied by such forward-looking statements. Such factors include, among others, the following risks: failure to satisfy all conditions precedent to the transaction, including disinterested shareholder approval and stock exchange regulatory approval, and the additional risks identified in the management discussion and analysis section of the Company's interim and most recent annual financial statement or other reports and filings with Canadian securities regulators. Forward looking statements are made based on management's beliefs, estimates and opinions on the date that statements are made and the respective companies undertakes no obligation to update forward-looking statements if these beliefs, estimates and opinions or other circumstances should change, except as required by applicable securities laws. Investors are cautioned against attributing undue certainty to forward-looking statements. 1 Technical Report "Resources California Gold-Silver Project" dated October 25, 2012 available under Galway Resources Ltd.'s SEDAR profile. 2 Technical Report "Preliminary Assessment La Bodega Project" dated November 8, 2010 available under Ventana Gold Corp.'s SEDAR profile. 3 Technical Report "Resources California Gold-Silver Project" dated October 25, 2012 available under Galway Resources Ltd.'s SEDAR profile.